The same pickups made famous by the Metallica front man, now with a different look. Now available in EMG Metal Works Finishes and EMG's Solderless Installation System components, the JH Set consists of the JH-N (neck) and the JH-B (bridge). Both pickups were patterned after the pickups James has used for 30 years but the end result was a completely different animal. The JH-N has individual ceramic poles and bobbins that feature a larger core and are taller than the 60. This produces more attack, higher output, and fuller low end in the neck position. The JH-B uses the same type of core but has steel pole pieces, unlike the 81 that uses bar magnets. This produces the familiar tight attack with less inductance for a cleaner low end. The 81 is the most famous model; the one that started a revolution. Utilizing powerful ceramic magnets and close aperture coils, the tone is endowed with detailed intensity, incredible amounts of high end cut and fluid sustain. Traditionally used in the bridge position, this pickup will make your leads slice right through even the densest mix like a hot knife. When used in both positions the sound can only be described as blistering. Other recommended pairings include the classic 81/85 setup and the versatile 81/60 combo. 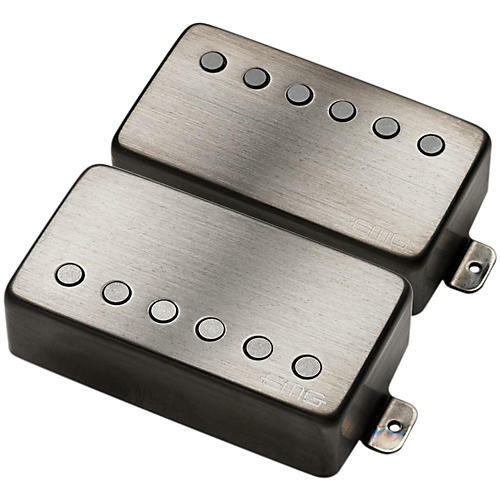 Metal Works consists of six stainless steel cap options for any of their active or passive humbucker pickups. These U.S.A made caps are available in Gold, Chrome, Brushed Gold, Brushed Chrome, and Brushed Black Chrome. Pioneers of the "Black Pickup", EMG has become recognizable worldwide and used by millions of guitar and bass players. The team at EMG is set to make history again with the introduction of the new Metal Works series. These striking new designs offer players and instrument builders a broader range of premium cap options. All the power and clarity of EMG electronics, now with a modern classic look. Give your guitar more bite and clean low end with this pickup set. Order today!